“I had never really felt, in my bones, the weight of it all. I had never felt a sense of real fear, for myself, for those I love most, and for all of humanity. But that was what rushed over me when I finished working in Siberia” Climate change photographer Katie Orlinsky on a National Geographic assignment about permafrost (2018). This article is about the importance of connecting and managing our fear and anxiety to adapt and develop resilience. Many people that are aware of our existential threats can be anxious, afraid, and dreadful. Occasionally, I feel the same. The good news is that if you are anxious or afraid you’ve managed to actually perceive the threat. Fear is likely a barrier to awareness and acceptance of our crises; our challenges are so overwhelming that at a subconscious level many among us choose not to engage with our reality and fall into denial. The bad news is that fear and anxiety can paralyze us. It can also lead us to despair, or cloud our judgement. I’m not going to tell you that there’s nothing to fear and that we will likely “solve” our predicaments. Based on what we’ve done so far in terms of facing our environmental, energy, overpopulation, and climate disruption crises, it is way more realistic to consider a bleak future as possible. Many resources recommend activism as an antidote to despair. I recommend Extinction Rebellion if that’s a path you would like. It is reasonable to seriously consider the possibility of defeat. After all, the odds are not looking good. I’m not saying that we should stop doing activism, we need it, but we should also prepare and adapt. If you aren’t afraid, you’re not paying enough attention, and you’re not aware of how destructive collapse could be. You’re not aware how badly damaged our life support systems are. Fear and anxiety are emotions that we must acknowledge, connect to, and then let them go through us, like a passing wave. These emotions force us to think about our crises instead of denying them; they motivate us to act. That’s why it is important to embrace them. Climate change is a powerful catalyst that is making people aware that business as usual is a dead end. By no means is climate change our only existential threat, but it does act as a threat multiplier to other crises. What creates more sense of urgency than fear? When fear and anxiety overtake our mind, they impair our ability to accomplish difficult tasks. Preparing for an energy-descent, climate-disrupted future, in which food, water, energy, society and transportation are likely to become increasingly disrupted, is not an easy endeavour. We must remain calm in order to prepare and adapt. 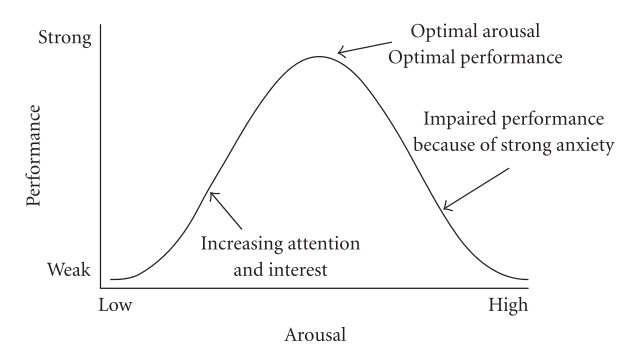 Below is a graphic showing the relationship between arousal (fear & anxiety) and performance when doing difficult tasks. Notice how having moderate amounts of stress and fear increases performance. So fear and stress are useful in low doses because they keeps us on task and can actually help us make better decisions. But how can we manage those feelings so that they don’t become a hindrance? The best way to manage fear and anxiety is to live in the present. Fear can’t exist in the present, and when it does, it’s only for a brief period of time when there is immediate danger. Deep breathing is a good way of calming our body and thus our mind. Breathing exercises like box breathing can reset your mental rhythm and take your mind off a negative path of fear and anxiety. They are very effective at calming and improving your mental state. Mindfulness is another great way of calming yourself. It basically is just trying to be present and aware of your body and mind: your sensations, feelings, and thoughts. This awareness has to be non-judgemental (think of them as neutral, not negative or positive), don’t dwell on your thoughts just let them pass through you. The disadvantage of mindfulness is that it might be harder for people to practice during highly stressful situations. Other than that, there’s a reason why it is so widely recommended. Fear and anxiety can cause us to paralyze. Instead of a fight or flight response, we freeze. If we feel spaced out, shut down or ‘unreal’ we are detaching from reality. When we notice we are zoning out and going into autopilot we can try a grounding exercise to get us back to our bodies and the present. Allow yourself to be afraid; don’t resist the experience. It is natural. We must be comfortable with fear. If we focus on avoiding fear, it will be like being afraid of fear. And being afraid of fear becomes a self-fulfilling vicious cycle. A way of becoming more resilient to stress is through exposure to stress. Makes sense. There’s stress inoculation training, exposure therapy, and systematic desensitization. The idea behind these techniques is to first learn ways to cope with fear/stress/anxiety and then gradually become exposed to what triggers those emotions. The first step is to find ways to manage stress that work for you (like breathing techniques) and keep stress at tolerable levels. The second step is to become stressed. Gradually expose yourself to things that trigger that fear and anxiety. Ideally, you could expose yourself to controlled simulations of your fears, but most likely you’ll have to simulate them in your mind. Create vivid, specific visualizations, or mental imagery of what you fear, and immerse yourself in them. Once you can stay calm on those situation you should go further into your fear, and visualize things that make you even more fearful. The point is to walk calmly and gradually towards your fears instead of running from them. “Confront the end of your own life, and then figure out one thing you can do to channel your anxiety effectively.”7Climate anxiety doesn’t have to ruin your life. Here’s how to manage it. Coming to terms with death is a helpful step in collapse resilience and adaptation. If we confront the fear of death then we are free to live without having that fear controlling us. Thinking through what it is that we are afraid about death, and just taking the time to contemplate our eventual death can help us be more familiar with it. We are afraid of the unknown. Responding to collapse is not about fearing the future or being afraid of dying, it’s about accepting our existential threats and then preparing to face them in an intelligent way. If we just focus on delaying the inevitable we’ll be merely surviving, not living. Here is a list of actions from the American Psychological Association that can help increase mental resilience, and manage anxiety and fear.8Mental Health and Our Changing Climate: Impacts, Implications, and Guidance I’ve also added my thoughts. Build belief in one’s own resilience. People who feel positive about their ability to overcome a source of stress and trauma do better. Those who are able to reframe and find something positive in their circumstances tend to do better than people who are less able to regulate their thoughts, emotions, and actions. Humor is also great. For many, faith gives a sense of peace during difficulty. Having a spiritual practice can help people manage and find meaning in suffering during significant adversity. Nevertheless you don’t need spirituality to carve meaning in your life; finding your own meaning is an incredible aid. Preparedness: family, neighborhood, community response plans and resilience can help increase confidence, and the feeling of safety and reduce fear. One strategy frequently noted in resilience studies is cultivating and maintaining strong social connections. Connectedness to others is a core psychological need and an essential foundation for well-being. During difficult times, people turn to those they are close to, such as family, friends, and neighbors, for emotional support, as well as material help. Social support is a critical protective resource during adversity. 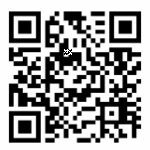 If you find this blog useful or valuable, please consider making a small contribution to support this blog and its author.